Architects, specifiers, and security and access control specialists look to Wisconsin-based manufacturer that set the industry standard for meeting access requirements of the Americans with Disabilities Act - whether the need is custom or standard. 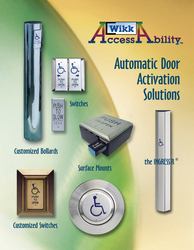 Wikk Industries, Inc., a Greendale, Wisconsin-based designer and manufacturer of the AccessAbility™ automatic door activation solutions line continues to partner with architects, specifiers, and security and access control specialists faced with the challenge of balancing architectural aesthetics and the access requirements established through the Americans with Disabilities Act (ADA) in 1991. The company manufactures switches, bollard posts, and accessories and sells through its worldwide network of automatic door and door hardware distributors. A great example of Wikk helping building owners and occupants bring the beauty of architectural integrity and the functionality of ADA compliance together is exemplified through the company's exclusive INGRESS'R®. This revolutionary switch is a 36-inch vertical touch activation column that provides accessibility with great ease for everyone. "By simply bumping the INGRESS'R with the footrest of my wheelchair, I am able to activate the door operator," explains Harold Kiewel, AIA, CSI, CCS, architect and specifications writer for HMC Architects. "It's such a clean, simple, truly functional solution -- and the end result is a welcoming design that leaves no one out, whether the building is modern, post-modern, or a historic restoration." With five different sizes, seven shapes, 12 legends, and custom engraving -- in addition to electrical, key, pneumatic, and wireless switching, Wikk offers one of the most comprehensive lines of switches in the industry. Wikk is renowned for its custom work and highly responsive turn-around time. "I can't think of a company that does a better job complying with federal code on custom and off-the-shelf products," adds Eric Magdal, owner of Straughan Hardware, a commercial hardware distributor contracted to supply switches. Leading the way with the most variety of standard and customized round and square bollard posts in a number of finishes, many models can be customized with slanted tops and have the option of a removable or welded cap. Wikk's square model in durable Stainless Steel is new to the bollard line (round is also available in this alloy). The Stainless Steel line is in a class all its own, and the post itself can be customized with recessed cutouts. For painted finishes, round and square bollard posts are available in mill finish-aluminum. Depending on your specific order, Wikk may be able to provide the painted finish. Wikk Industries is also pleased to introduce its partnership with Estes Marketing LLC, a new manufacturer's representative agency, providing skilled professional service and support for Wikk and its customers in Washington, Oregon, Idaho, Montana, and Alaska. Our 28-year history has brought many exciting changes at Wikk Industries, and our commitment to our customers remains constant. Our state-of-the-art automatic door activation solutions are easy to order, install, and use -- and all are backed by our superior customer and technical service and support. Members of the media can contact Lori Bedard at 877-421-9490 x12, or email at: lori @ wikk.com. Wikk Industries, Inc. can be found on the Internet at: http://www.wikk.com.